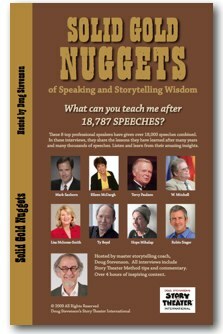 In these 4 CDs, you’ll hear interviews with 8 top professional speakers who have given over 18,000 speeches combined. They share the lessons they have learned after many years and many thousands of speeches. Hosted by master storytelling coach, Doug Stevenson, the interviews also include Story Theater Method tips and commentary.